Dwarf Pomegranate is considered an ornamental shrub, however it does produce fruit that is edible. This fruit is smaller, more acidic, and less palpable then the fruit of the larger less hardy Pomegranates such as ‘Wonderful’ and ‘Utah Sweet’ however it is an enchanting and interesting feature. Dwarf Pomegranates begin to bloom in late spring and from the flowers come 2″ reddish-orange fruit. Once they begin to flower they will bloom freely producing bright orange flowers from early summer through fall. The botanical name ‘Nana’ is derived from Latin, nanus, meaning small or dwarf. 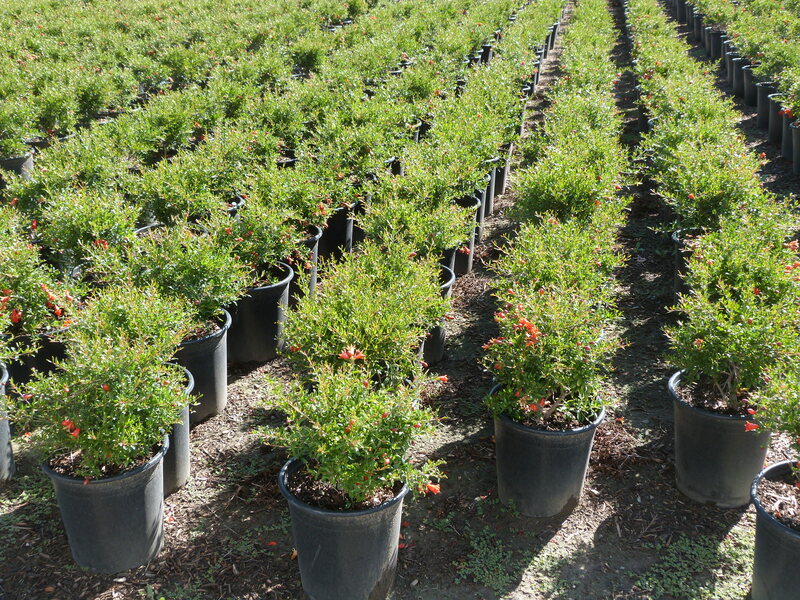 This is a small to medium sized shrub that is quite versatile. It can be kept to a smaller size, down to 1′ tall with pruning, or allowed to grow naturally to around 3′. It has attractive medium green glossy foliage and can be mixed into the shrub border for color, used as a low sheered hedge or barrier, or displayed in decorative containers on the patio. It is also a very popular and beautiful subject for bonsai. This is a semi-deciduous shrub so in colder climates it may drop most of it’s leaves in winter. Durable, it is deer resistant, drought tolerant, and very adaptive. It prefers full sun but can take some light shade and also tolerates alkaline soil. It is easy to maintain and once established and will only need moderate watering; however extra water during the blooming season is appreciated and will increase the flower and fruit production. The best time to prune Dwarf Pomegranates is in early spring before the buds break dormancy and begin to grow but after the last frost so that any new growth that is forced by the pruning is not damaged. This is an all around great plant that should be implemented more often in landscapes for the wide array of it’s valuable attributes.